The Singer Team conceptual design demonstrates how the buildings and site can become an armature for an Urban Regenerative Network. This Network is based on utilizing the facility’s core resources such as its physical footprint, surface area and structure, waste heat, CO2 and stormwater. One of the primary concepts is to wrap the main power plant building exterior walls in green houses, taking advantage of these highly structured walls, natural light, CO2, waste heat, and harvested rooftop rainwater already inherent in the project. These greenhouses could grow local food, wetland plants for nearby restoration projects and even host alternative uses such as a community heated indoor swimming pool and hot yoga classes. One associated concept was to utilize some of the greenhouses for algae biofuel research that could also tap a portion of the facility CO2 output. The facility was also planned with an extensive naturalized green roof for avian wildlife and rainwater collection. The internal workings of the planned cogeneration facility were already advanced, utilizing nearby sources of treated wastewater and feeding steam directly into the City’s steam network thereby achieving a stated 76% efficiency (which would be even higher with the utilization of further waste-heat resources). 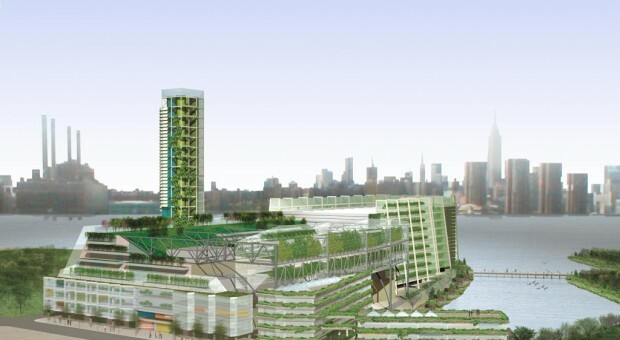 Other project concepts include the full clean-up of the adjacent Bushwick Inlet (which remains heavily polluted), public waterfront access, the integration of a specialty public charter school for the environment, a museum for the Civil War vessel the USS Monitor (that was launched from Bushwick Inlet), an adjacent refurbished warehouse building for artists’ lofts, and the combining of the 4 emissions stacks into a singular iconic stack with planters and solar arrays. TGE included the Singer Team design as part of their Article 10 application to the New York State Public Service Board. Unfortunately, despite efforts of the Singer Team, many of the concepts and benefits of the design were never presented to the community. Local community opposition to the project ultimately stymied TGE’s efforts to build the project. NYC Parks currently has plans to purchase the site for a combined 28 acre Bushwick Inlet Park, though as of summer 2012 funding for the park remains uncertain.